HAGER HILL Irene and David Morris could have packed up and taken jobs elsewhere, maybe back home in Ohio or Michigan, when the owner of the manufacturing company retired and sold out. If that had happened, Atlantic India Rubber Co. grommets and parts might be made in China now. But the Morrises working as manager and executive decided they’d poured nearly 10 years of their life into building the factory in Johnson County. They cared about their employees, all hired locally when the 90 plus year-old company moved from Illinois and Ohio in 2003. They cared that the rubber parts used on Harley Davidson motorcycles and Arctic Cat snowmobiles and Boeing jets are made in the U.S.A. They wanted to save their jobs. And ultimately, Irene Morris said, the company survived “one of the toughest years ever” for manufacturers, so “we knew the business was sound.” So the couple, whose children are grown and whose only debt was a mortgage and a car loan, borrowed nearly $1.3 million to buy out their employer last summer. Many manufacturers haven’t fared so well. Since 2005, Kentucky has lost more than 18 percent of its manufacturing jobs. Some counties have lost as many as a third of their manufacturing employers and more than 60 percent of manufacturing jobs, according to the Kentucky Office of Employment and Training. The Morrises’ purchase of Atlantic India Rubber helped Johnson County buck that trend. The company is one of nine manufacturing employers in the county. Atlantic India’s eight employees count for less than 10 percent of the 135-strong manufacturing labor force in the county. But since 2005, Johnson County’s manufacturing employment has grown by nearly 12 percent. They brought two employees from Michigan, including their son, who now manages a restaurant in Paintsville. But they hired the rest of their employees locally. The Morrises worked to improve the quality of their products and relationships with customers. Atlantic India’s owner, Jim Green, was a former Johnson Countian who knew the area but lived in Florida. He trusted Irene and David Morris to run the business as though it were their own. Irene Morris said her husband, who had served in Germany and Spain in the Army, was the one who talked her into pulling up her Michigan roots to move to Johnson County in the first place. “I didn’t have a lot of faith in my ability,” Irene Morris said. Now, the Morrises need a tool-and-die maker, for example, but the market is so geared toward the coal industry, they aren’t sure where to start looking locally. Also, they are pleased that one of their Oregon contractors might be opening up facilities in Ohio, cutting travel and distribution costs. 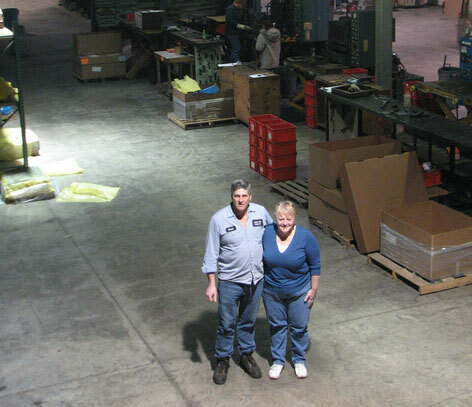 When they first moved to Hager Hill, Irene and David Morris lived in their warehouse while trying to establish the business. They had to have machines shipped in and find workers they could train to run them. They still feel like outsiders in Johnson County, but local leaders have welcomed them, Irene Morris said. She has a relationship with the local chamber of commerce, the judge-executive, state representatives. She said she personally knows the local UPS and FedEx workers, as well as bankers and suppliers. “They made us feel like a big deal, even though we were small,” Irene Morris said. The Morrises were managers, but they knew every job in the business and were hands-on. They filled in for their workers, and they trained a press operator to fill in for them. They bought a house and two cars, and their son eventually moved on to other jobs. “We’re just ordinary people,” Irene Morris said. She didn’t have aspirations to “get rich” or even to own her own business until a couple of years ago, when her boss decided to retire and sell. There were interested buyers, but none with ties to Johnson County. The economy was starting to slide, manufacturing jobs nationwide were disappearing, and the Atlantic India brand might have been valuable enough to those outside buyers without keeping the manufacturing in Kentucky. A few years earlier, a major Johnson County manufacturer, American Standard plumbing parts, had sent hundreds of jobs to Mexico. The Morrises feared Atlantic India would have had a similar fate. The couple made contacts with local government and non-profit groups, as well as the state Cabinet for Economic Development. The Morrises are part of a trend, said Economic Development Commissioner Erik Dunnigan. In 2010, 84 percent of job growth and investment growth came from existing local companies, as opposed to companies new to Kentucky: “That’s redirecting our efforts,” Dunnigan said. In September 2009, Atlantic India started talking with Mountain Association for Community Economic Development, a Berea non-profit. MACED and Southeast Kentucky Economic Development, a London non-profit, began the year-long process to help Atlantic India secure nearly $1.3 million in financing to buy the company and the building they were leasing. Irene Morris had to write an application for the loan, a three-year forecast, growth projections and a business plan. She said she knew the manufacturing side of her work, but she had to learn quickly about the financial side. Half of the loan came from a federal Small Business Administration program handled by SKED; the other half came from MACED. If the couple defaults, the organizations would seize the business and property. The feeling, when they signed their names to the loan, was both empowerment and trepidation. “We’ve never been that far ever in debt,” David Morris said. But he believed in his wife. Irene Morris is officially the 51 percent owner, which gives the company a leg up in some contracts because it can call itself a “woman-owned” business.